Brake Fail 1st Episode. 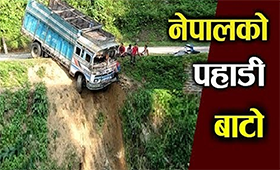 Brake Fail is a nepali comedy presented by Media Hub with Digital Partner RamSar Media Pvt. Ltd. This TV Serial broadcasts every Monday at 8:50 PM on Nepal television. Shiva Hari Paudel as Chatyang Master, Kiran Kc as Gharbeti, Rajaram Paudel as Neta ji are main artists of this serial. This Episode is Directed by Shiva Hari Paudel and Kiran Kc. This is the 4th Episode of Brake Fail and first episode was aired on 28th March 2016.